It’s Time to Stock Up on Those British Candies for Easter! Less than a month to go before those egg hunts and chocolate candies in egg, squirrel, bunny, and other shapes are unwrapped and gobbled. Better be sure to stock up now so there’s no shortage when that time comes! Some of the most popular British candies for Easter are Cadbury crème eggs and their Mini Eggs, both of which are only produced around Easter. They’re so delicious, though, that they could be enjoyed all year round. The Cadbury’s Mini Eggs have a crisp sugar-coated shell and their famous Cadbury chocolate centers, and the Cadbury Crème Eggs have a thick chocolate shell with a gooey fondant crème center that looks like a real egg with a yellow “yolk” and bright “white” part. The crème eggs are now the biggest selling confectionery in the UK between New Year and Easter, selling around 200 million, and the Mini Eggs, originating in 1967, are usually sold around Christmas and Easter, but available in Canada year round. Gift baskets with cute stuffed bunnies in them are always pleasing, too! The Bunny Fun Easter Gift Basket is a great example and includes a 12-inch Plush Bunny, a Whoppers Milk Carton, 2 Toasted chocolate covered marshmallows, Sugar coated sour patch gummy worms, Marshmallow Peeps, a cotton candy tub, edible fruit Easter grass, milk chocolate foil wrapped Easter bunny, all in a white Easter basket. 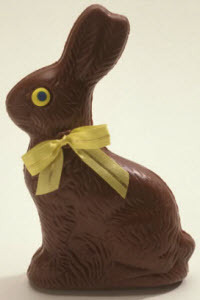 Chocolate bunnies seem as popular on both sides of “the pond” (aka the Atlantic Ocean). My siblings and I would share a large one and get into quite a row over who would get the head, which we all considered the best part. My mom wised up in subsequent years and got each of us smaller ones so we could each nibble on those ears! Whatever your preference, keep your indulgences to a sensible level – only a dozen or so of those crème eggs at a time – hee!